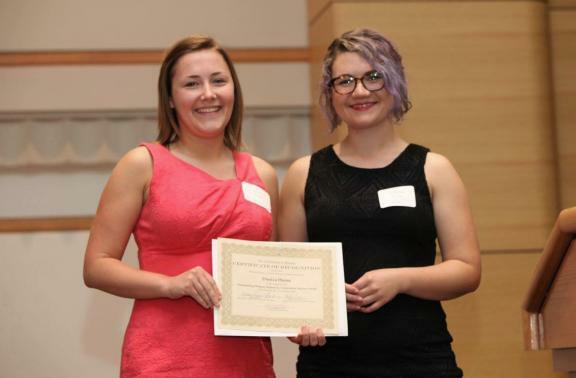 LAWRENCE — Twenty women with ties to the University of Kansas were honored April 7 during the 2015 Women’s Recognition Banquet hosted by the Emily Taylor Center for Women & Gender Equity. Event organizers inducted six women into the KU Women’s Hall of Fame as well as presented honors to a number of outstanding students, faculty and staff at KU. The Women’s Hall of Fame has honored more than 200 exemplary KU alumnae, faculty and staff women since 1970. It recognizes those who through their significant contributions and achievements, overall effect and outstanding character, serve as role models for students as career women and community leaders. The Hall of Fame is on the fifth floor of the Kansas Union. A complete list of Women’s Hall of Fame inductees and their accomplishments is available online. In addition to the inductees, 14 women were honored as recipients of 11 different awards. The Emily Taylor Center for Women & Gender Equity provides leadership and advocacy in promoting gender equity and challenging gender-related barriers that impede full access and inclusion. The center raises awareness of critical issues, provides opportunities to translate awareness into action and empowers individuals to advocate for themselves and others. Ann M. Brill, doctorate, dean of the William Allen White School of Journalism & Mass Communications. Brill joined the journalism school in 2000 and became dean in 2004. Brill also serves as the president of the Association of Schools of Journalism and Mass Communication (ASJMC), in addition to taking many other national leadership roles. The school has flourished under her leadership and has received numerous grants from national foundations. She initiated significant curriculum revision for the school and oversaw the launch of its first doctoral program. Brill is dedicated to the students and has been extremely successful in raising support for the school. She has created and endowed multiple new scholarships and awards, which greatly benefit the students, the school and the university. Her peers and colleagues describe Dean Brill as visionary. Burk’s career of advocacy and activism began while she was studying at KU. As a student on campus, Burk was a member of many organizations — such as the February Daughters and Students Against Violence Against Women — and fought for progressive change. This activism spurred Burk to work for Women’s Transitional Care Services (now the Willow Domestic Violence Center in Lawrence), where she eventually became co-director. Under her leadership, the center expanded from sheltering survivors to raising awareness and educating the community about domestic violence. Burk also served as vice president of the Kansas Coalition Against Domestic Violence. As an undergraduate, Karen Mitchell Humphreys was an honors student. She was inducted into both CWENS and Mortar Board as well as being chosen as the outstanding woman of her sorority. She was one of only 12 women admitted to the School of Law in 1970. In 1978, Humphreys was appointed to the position of district judge for the 18th Judicial District in Sedgwick County. She remained in this position until 1993, when she was appointed as U.S. magistrate judge. KU’s Emily Taylor was on the selection committee for Humphreys’ appointment. Humphreys was the first woman to serve in this position. From 2003 to 2013, Humphreys was designated as the chief magistrate judge and led other federal magistrate judges in the area. In this position, Humphreys led an effort to create a specialty court, known as KAN-Trac. This program, which assists felony offenders re-entering the community, has been extremely successful. Humphreys has been referred to as the “human glue” which holds the program together. In recognition of her work on KAN-Trac and other programs, she has received many awards from the Kansas Women Attorneys Association, the Wichita Women’s Association, the Kansas Bar Association and the Wichita Bar Association. Humphreys retired in January after more than 20 years of service to Kansas and more than 40 years in the field. Dr. Lukert’s career at the KU Medical Center spans more than five decades, beginning with her residency in 1961. Since joining the Department of Medicine faculty in 1965, Lukert has served as the Mary F. Roberts Distinguished Chair in Nutrition, the director of the Osteoporosis Clinic, the Metabolic Laboratory and as the medical director of the Medicine Outpatient Clinic. She has lead or co-authored 96 full-length manuscripts and written 11 books or book chapters, served on the Wyandotte County Medical Society, and she serves on the editorial board for the Journal of Clinical Endocrinology & Metabolism. Dr. Lukert is a nationally recognized educator, scholar and researcher. Among her many awards are the Boy Frame Award for Excellence in the Field of Bone and Mineral Metabolism, the KU Chancellor’s Teaching Award in 1982, the School of Medicine Distinguished Alumnus award in 1990 and the Honorary Health Professions Alumnus Award in 1999. Dr. Lukert is also the namesake of the Lukert Academic Society. President George W. Bush appointed Robinson as the U.S. district judge for Kansas in 2001. A trailblazer in her field, Robinson is the first African-American woman to be appointed to this position. Robinson has served as a U.S. bankruptcy judge in the District of Kansas, a judge on the 10th Circuit Bankruptcy Appellate Panel and an assistant U.S. Attorney in the District of Kansas. Robinson has received numerous awards for her work, including commendations from the Secret Service, the Kansas Dr. M.L. King Jr. Memorial Committee’s Women of Distinction Award, the Baker University Trustee Medallion for Distinguished Public Service Award and the National Bar Association’s Wiley A. Branton Symposium Award. Before her current appointment, Robinson taught trial practice courses at KU. She also has served on the KU School of Law Board of Governors as president and on various committees. Truglio’s leadership of the Sesame Workshop creates an incredible legacy. Research has shown that high school students who watched the program when they were in preschool receive better grades in their classes and read more books than the average student. Truglio, who was only 20 when she began graduate school at KU, has received the Annenberg Public Policy Award for her innovative development process. Hardesty currently serves as the director & managing attorney for KU’s Legal Services for Students (LSS). She has been with LSS for 35 years and has served as director for 29 years. In her time with LSS, Hardesty has demonstrated exemplary passion and leadership. Not only is she dedicated to the office’s mission of providing KU students with legal services and workshops, but she continues to inspire and mentor those around her, both students and colleagues. In addition to her work with KU, Hardesty also has been recognized for her work with the National Legal Aid & Defender Association for her service to the legal community and her commitment to social justice and equality, as well as her work with the IRS’ low-income taxpayer clinic program. The award honors a female unclassified or classified staff member who, through outstanding work performance, has contributed to the academic and personal growth of KU students. Hoose is a junior studying accounting and economics and a graduate of Parsons High School. She is a senator in KU Student Senate, works in the Office of the Provost and serves as the president for Omega Phi Alpha, KU’s only service sorority. She was elected president of her sorority after only one year as an active member, and the sorority has been very active under her leadership. The award honors a woman student who has made outstanding contributions to off-campus organizations or agencies. Jones-Jamtgaard is a doctoral student at the KU Medical Center and graduate of Duke University. She is president of Students Educating and Advocating for Diversity, vice president of the Student Governing Council and former president of Graduate Student Council. In addition she is involved in creating and collaborating on numerous projects and groups at KU. Jones-Jamtgaard also spearheaded the creation of the KUMC Childbirth Accommodation Policy, which is now used as a template at universities across the state. The award honors a woman student who has demonstrated outstanding leadership skills by taking an active role in campus or community organizations, developing a new project or addressing a current need. Kader is a doctoral candidate from Bangladesh studying architecture health & wellness with a focus on gerontology. She received her master's degree from Texas A&M University and her bachelor's degree from Bangladesh University of Engineering & Technology. Through her short career, Kader has already earned an international reputation for her academic and professional work. Most recently she received the International Fellowship by the American Association of University Women and the American Institute of Architects’ Arthur Tuttle Jr. Graduate Fellowship in Health Facility Planning and Design. She also presented at the Capitol Research Summit in 2014. Kader served as the founding president of the Bangladesh Student Association at KU, developing community support systems and organizing events in the area. In this role and in her personal life, Kader has served as a mentor and inspiration to many students. The award honors an international woman student who has demonstrated academic achievement and has made a contribution to the campus and/or community through her involvement. Marcinkowski is a senior majoring in women, gender, and sexuality studies with a minor in history. She received her G.E.D. in 2001. Marcinkowski has faced many obstacles in her path to receive her degree, but she has persevered and will graduate this spring. Marcinkowski works as an accommodation specialist for the university and serves as the president of AbleHawks and Allies. AbleHawks is a student group dedicated to raising awareness, advocating for accessibility and promoting disability as multicultural issue. Marcinkowski is a passionate advocate and an effective leader. Through her work and her leadership of AbleHawks, KU has become a better place. The award honors a nontraditional woman student who has demonstrated academic achievement and has made a contribution to the campus and/or community through her involvement. McHale is a second-year graduate student at KU pursuing a master’s degree in higher education administration. She is a graduate of Iowa State University. McHale is the higher education graduate assistant for the Student Involvement and Leadership Center. In her two years at the university, McHale has had an effect on the greek community and the campus community as a whole. She has served on numerous committees, developed programs, taught classes and facilitated retreats. She has been credited with showing passion and care for the students she serves. McHale has demonstrated noteworthy dedication to sexual violence prevention and education. She has served on the Title IX roundtable, worked with the greek sexual assault task force and developed a program focused on the effects of overconsumption of alcohol and sexual violence. 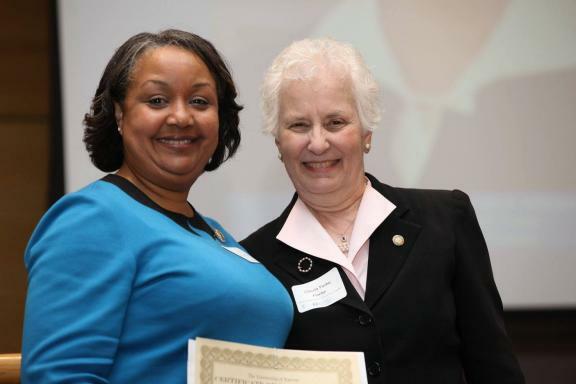 The award recognizes a woman graduate or undergraduate student who has contributed to the success of another student. Shannon Portillo, doctorate, Kathleen McCluskey-Fawcett Woman Mentoring Women Award. Portillo currently serves as an assistant professor and the undergraduate program coordinator for the School of Public Affairs and Administration. Women who’ve learned with, through and alongside Portillo point out that she teaches not just directly, but also by example. She is credited with showing deep care for her students through her accessibility and willingness to offer career advice and guidance. Moreover she offers inspiration and encouragement to overcome self-doubts and build confidence among her students. 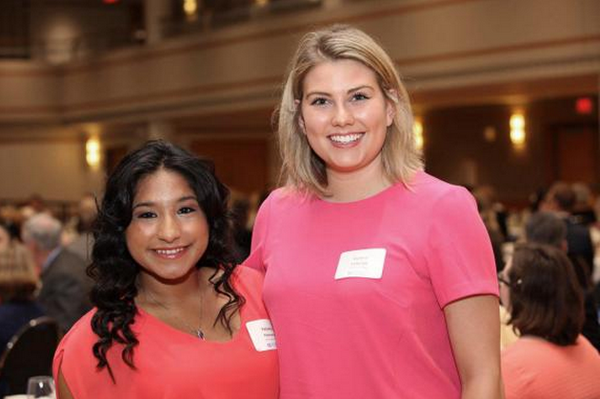 The award honors a woman student, staff, or faculty member who has demonstrated outstanding commitment to the support and mentoring of women at KU. Pringle is a junior majoring in history and environmental studies and graduate of Chanute High School.In addition to her academics, Pringle is involved in a sorority and has served as an orientation assistant and as the chairperson for the Finance Committee of KU Student Senate. Within Student Senate, Pringle has impressed her peers and mentors with her ability to lead effectively and to bring people to the table. The award honors a woman student who has made outstanding contributions to students through her collaborative work and interactions with campus departments, services or organizations. Saha is a second-year pharmacy student at KU, set to graduate in May 2017. She is a graduate of Blue Valley Northwest High School. Saha co-authored an article titled “Loss of GluN2A-Containing NMDA Receptors Impairs Extra-dimensional Set-Shifting,” which was published in Genes, Brain and Behavior, a notable scientific journal. Saha recently received a travel award through the Harvard Medical School to present at the New England Science Symposium in April. Saha also works with Hawk Link tutoring, is on the executive board for Kappa Psi, the professional pharmaceutical fraternity, and writes for the University Daily Kansan. The award honors a female undergraduate or graduate student in the sciences who has demonstrated academic excellence, involvement in campus activities, and leadership in her academic department. Wilson currently serves as a professor and as the associate dean for academic affairs for the School of Law. An expert in her field, Wilson has served as an assistant attorney general in Georgia, co-authored four books and many scholarly articles, and she has won numerous awards and commendations for both her work as an attorney and as a professor. In addition to her other roles, Wilson is also the director of diversity and inclusion for the law school. Wilson continues to make sure students feel safe and empowered in every space. Wilson was recently selected to become the next dean of the University of Tennessee College of Law. The award honors a female professor, instructor, or student teaching assistant who, through outstanding teaching skills, has contributed to the academic and personal growth of KU students.